The Last year a Miami Dolphin Tight End made a Pro Bowl appearance was in 1993. His name was Keith Byars and he was a running back playing out of position. Miami was a team known for great tight end play during the times of plenty. Marv Fleming, Jim “Mad Dog” Mandich, Joe Rose, Bruce Hardy, Ferrell Edmunds, Keith Jackson, Randy McMichael, even names like Howard Twilly and Jim Jensen are associated with the position. The skid of the Miami Dolphins runs parallel with the drought at the TE position. The inability to make critical plays in the redzone where great TEs live comes to life in the stats from the 2012 season. Consider the following graphic. 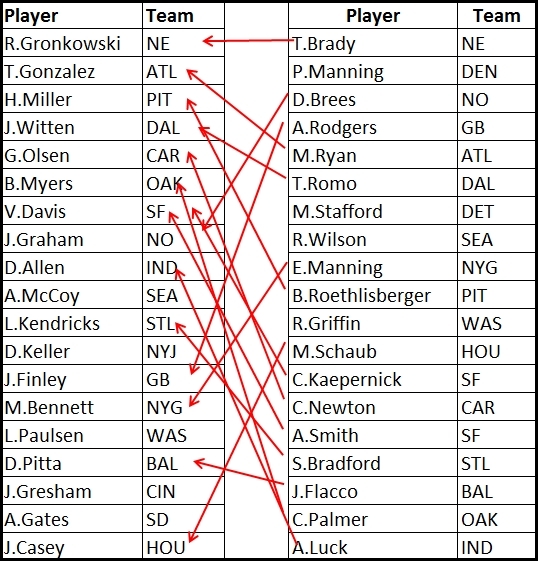 These are the top twenty passers in the NFL and the top twenty tight ends from 2012 as compiled by www.footballoutsiders.com. All those arrows are not coincidence, TEs are a QB’s best friend on the football field. Anthony Fasano may not have been an awful TE, but he is not to be confused with the players on this list. One which happens to be, Dustin Keller who was having somewhat of a down season and still managed to make the top twenty. The Dolphins have neglected or devalued the position throughout their history. Jim Mandich along with Andre Tillman were selected in the 2nd round of the draft (Andre who?) and through nearly 50 years of drafts, Miami has never selected a TE in the 1st round. The chart above demonstrates the importance of the position related to the success of a QB and yet it has been a forgotten position in Miami. It is not a coincidence the Dolphins have been unable to establish respectable quarterback play during the TE drought. It is inevitable when the safety valve is missing from the arsenal. Jim Jensen was not considered a true tight end, but ask Dan Marino what player he looked for in critical situations and number 11 will be high on the list. The 1994 Dolphin team that suffered the devastating injury to Marino was primed with Keith Jackson in the fold. The Dolphins could have helped young Ryan Tannehill by bringing him the safety blanket of Tyler Eifert in a first, first at TE, but chose to trade up for Dion Jordan, again devaluing the position. Leaving Dustin Keller, who could turn out to be the best free agent acquisition for Miami this year if he remains healthy. If Keller can provide Tannehill with a consistent target and force safety attention away from other receivers, Tannehill will shine. Looking closely at the tight end position on any NFL football team provides a tremendous key to the style of play anticipated on the field. A player like Fasano limits a team in the passing game because he is not a natural receiver. His motions and route running are not smooth enough to elude many linebackers and most safeties. A TE like Fasano got open by scheming him into open spaces. His presence as the number one TE was the primary key to defenses diagnosing Miami's rushing attack. Watching Fasano come out of his stance, keyed whether the play was a pass or a run. To evolve into the offense Joe Philbin and Mike Sherman hope to employ, the Dolphins need look no further than the top of their own division. The Patriots are redefining the NFL passing game using tight end play. The game already dictates a QB throw into tight windows, throwing to a bigger and stronger target can only increase the chances of success. Having multiple TEs willing to block and get behind defenders in the passing game, opens the running game as well. The reason the TE has been neglected, may not be a deliberate slight by the Dolphins, there are simply not many humans capable of playing the position well. The TE must be able to block like a tackle with the speed and hands of a wide receiver. Those guys are hard to find on this planet. The parallel between the Miami QB drought and the Miami TE drought means, perhaps the Dolphins should reconsider the value of the TE in the modern offense. This season belongs to Dustin Keller. A great receiving TE has not been seen in these parts for nearly two decades. Ryan Tannehill needs a safety blanket and the redzone needs a stud. Keller signed a one-year deal to prove to Miami and the NFL his real value. He could not have chosen a better landing spot. The rise of Ryan Tannehill may very likely coincide with the acquisition of Dustin Keller.